Beautiful Home with SOLAR HEATED POOL & WATERFALL. City water/sewer utilities and ASSESSMENTS PAID!!! Floor plan offers split floor design with master on one side of the home and guest room on the other side for the utmost privacy. Screened entryway for those nice breezy days. Master Bedroom has BIG walk-in closet. Master bathroom, with TRAY CEILING, is a pool bath–offering separate entrance to the Pool area. Living room sliders pocket behind the wall for open-air living. Large screened lanai has pass thru window to kitchen and oversized pool deck. Kitchen also with TRAY CEILING, pantry, and some STAINLESS appliances. CATHEDRAL CEILING. Tile on the diagonal. NEW CARPET in guest bedroom. Lush landscape with PALM TREES and FENCED backyard with mango and citrus fruit trees. Off-set backyard offers privacy from neighbors. City website shows location is NOT IN A SPECIAL HAZARD FLOOD AREA. Cape Coral Community boat ramps offer boating access to the Gulf of Mexico. Close to Sanibel Beach, Fort Myers Beach, Cayo Costa, Cabbage Key& Boca Grand. Great location! Close to everything—yet set back in well-kept neighborhood. Fort Myers International airport is only about 20 miles away. Superbly maintained home with over 2,600 SQ FT of living area located on TRIPLE LOT in the PALACO GRANDE NEIGHBORHOOD. Lots of room for that big family and entertaining. City water/sewer in and ASSESSMENTS PAID!!! Floor plan features split floor design with master on one side of the home and guest rooms on the other for the utmost privacy. Striking TRAVERTINE flooring in Master Bedroom with en suite bath. 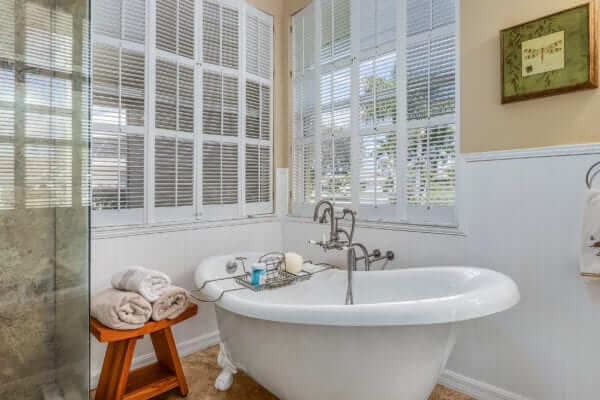 Master bath offers multi showerhead travertine shower and frameless door, claw-foot tub to relax in, and a BIG walk-in closet with plenty of storage. French doors in living room, breakfast nook and Master Bedroom all open to a spacious screened and tiled lanai area. Oversized 800sf Garage (24’ x 33’+) with 8’ doors will store your prized possessions. Kitchen offers Cherry and Maple cabinetry and STAINLESS appliances with convection oven. HIGH CEILINGS throughout. Beautiful backyard with WATERFRONT VIEW of the canal. Cape Coral Community boat ramps offer boating access to the Gulf of Mexico, Sanibel Beaches, Fort Myers Beach, Cabbage Key, Boca Grand, and more. Close to everything—shopping, restaurants, Ft Myers bridge, and Ft Myers Int’l airport is only 17 miles away. 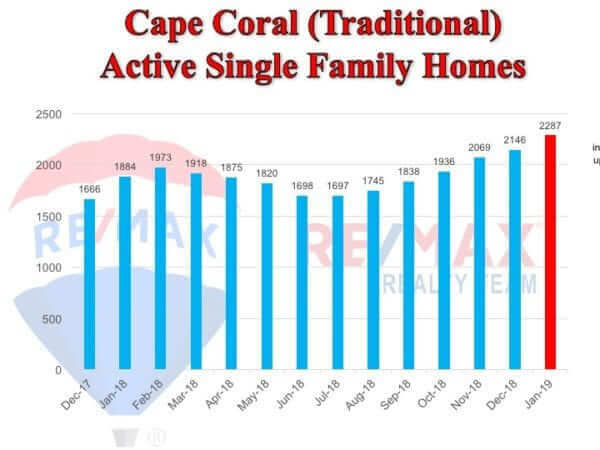 Over 2,200 single family traditional homes on the market, highest level in over 10 years. New inventory has risen approximately 4% since July 2018. This is a natural build up that repeats yearly. Home sales dropped in January to 261, even with the steady rise in inventory in the last few months, the number of properties coming off the market than those coming on the market are higher. 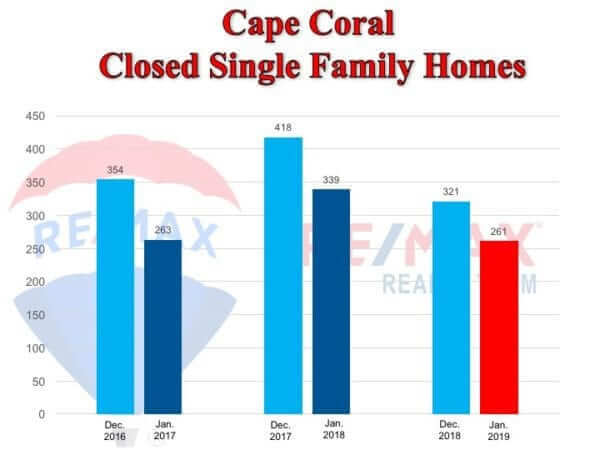 Cape Coral home prices rose 4% from last year, even with the surge in inventory, salable homes are selling within 97% of asking price and make up approximately 10-20% of the total market. New construction fell last month, the first time in year over year comparisons by 38%. Approximately 23% of all active inventory is new construction. An average growth in inventory of 5% since August, in one month the inventory levels surged 11%, although high, when comparing last year, we are below projected levels. Sales fell by 16% from January 2018 to January 2019. Total single family homes sold in January was 202. Average sales price of a single family home in Fort Myers virtually unchanged from a year ago. Although real estate markets are driven by supply and demand, buyer demand is driven by affordability and perception. 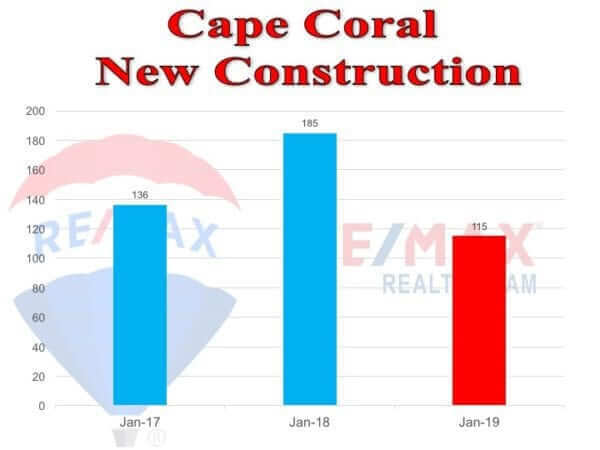 New construction rose by 15%, new construction has an impact on inventory, in Fort Myers this impact is approximately 11%.